This page includes some of the material covered in class in the introductory lectures about the historical King Arthur and the literary development of the legend. The pictures and excerpts from texts below are only a sampling; if you are interested in exploring the development of the Arthurian legend more fully, visit our course Resources page for suggestions about books and web resources you can consult. For a chronological listing of the references we have discussed in class during the introductory lectures, go to the Arthurian Chronology page. Cardiff Central Library MS 2.81. By permission of Cardiff Libraries and Information Services. The image above is from the Book of Aneirin, the manuscript that contains the Gododdin. You can view the whole manuscript on the People’s Collection Wales site. The earliest documentary reference to Arthur by name occurs in the Welsh poem Y Gododdin, a poem which commemorates British warriors who died in a battle at Catraeth, probably Catterick in modern Yorkshire. The period to which the poem refers is the 5th to 6th centuries, when the native Britons fought against Germanic Saxon invaders. In the forefront, an alder-shield was Gwawrddur. The manuscript belongs to the 13th century, though the poem is much older. To read more about the language of Aneirin, poet of the Gododdin, visit the BBC’s Story of Welsh homepage. You can also visit the Gododdin page I created for another class. The map to the right shows Britain at the historical period referred to in the Gododdin. The Historia Brittonum, compiled around 800 in Wales, includes a description of Arthur as the leader of the Britons in the war against the Saxons. To read a complete version of the text, visit The Avalon Project at Yale Law School, a wonderful online collection of documents relating to law, history, and diplomacy. Click here to go directly to the translation of Nennius. BL MS Harley 3859. By permission of the British Library. The Latin below is transcribed from the first section of the manuscript marked off in red, on the left. Where you see underlining in the transcription, this means that I have expanded the abbreviations in the manuscript, commonly used by medieval scribes to save space and time. Notice that there are very few obviously upper-case letters in the original, and very little punctuation. It is common to split words across line breaks. While the text of the Historia Brittonum is usually dated to around 800, this manuscript is an 11th-century copy, now British Library MS Harley 3859. This small image of folio 187r appears by permission of the British Library. Click the image to go to a much larger image of this folio in the British Library’s Digital Catalogue of Illuminated Manuscripts. multitudine et crescebant in brittannia. -num cantorum. et de ipso orti sunt reges cantorum. Tunc arthur pugnabat contra illos. The Historia Brittonum also includes a list of Arthur’s battles, perhaps taken from a Welsh battle poem. The second section marked off in red in the manuscript above is the list of battles; below you’ll find a translation of the list and a map with some possible locations for Arthur’s battles. Remember you can click the small image above to see a much bigger version on the British Library site. The first battle was at the mouth of the river called Glein. The second, the third, the fourth and the fifth were on another river, called the Douglas, which is in the country of Linnuis. The sixth battle was on the river called Bassas. The seventh battle was in Celyddon Forest, that is, the Battle of Celyddon Coed. The eighth battle was at Guinnion fort, and in it Arthur carried the image of the holy Mary, the everlasting virgin, on his shoulder, and the heathen were put to flight that day, and there was great slaughter upon them, through the power of Our Lord Jesus Christ and the power of the Holy Virgin Mary, his mother. The ninth battle was fought in the city of the Legion. The tenth battle was fought on the bank of the river called Tryfrwyd. The eleventh battle was on the hill called Agned. The twelfth battle was on Badon hill and in it nine hundred and sixty men fell in one day, from a single charge of Arthur’s, and no one laid them low save he alone, and he was victorious in all his campaigns. Click here to go to an online reconstruction of the whole of the Latin text. Finally, the Annales Cambrie, put together around 960-980 in Wales, provide some dates for some of the battles; they also include references to other characters who are, or will come to be, associated with the Arthurian legend, though without much detail at this point. In the image on the right, references to the battles of Mount Badon and Camlann are indicated. This is folio 190r of BL MS Harley 3859; click the small image to go to a much larger version in the British Library’s Digital Catalogue of Illuminated Manuscripts. The Battle of Badon, in which Arthur carried the Cross of our Lord Jesus Christ for three days and nights on his shoulders and the Britons were the victors. in Llan Padarn bet Kinon. bet Bedwir in alld Tryvan. in Llan Helet bet Owein. at Llanbadarn is the grave of Cynon. the grave of Bedwyr is on Tryfan hill. at Abererch is Rhydderch the Generous. at Llanheledd is the grave of Owein . the world’s wonder/ difficutly (anoeth) a grave for Arthur. 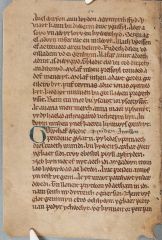 The image above shows the Arthurian reference as it appears in the Black Book of Carmarthen, National Library of Wales MS Peniarth 1 (image appears by permission of the NLW). Click the thumbnail above to view the whole manuscript; the excerpt above is found on fol. 34r. A small window will open: to find the folio and see it in full view, you will need to click the full screen arrow, and call up the Contents sidebar to see thumbnails of all the folios. Notice that a later annotator has labelled this part of the text in the margin. in the halls of Dissethach. by the hundred they fell. he would strike like a hundred. who has extended his rule over the strand of the world. according to the story of Pwyll and Pryderi. and before the spoils of Annwn sadly he sang. And until Judgement Day our bardic song will last. except for seven, none returned from Caer Siddi. I am honoured in praise, song is heard. my eulogy, from the cauldron it was spoken. By the breath of nine maidens it was kindled. dark about its edge with pearl? It does not boil a coward’s food; it has not been so destined. And before the door of the gate of hell, lanterns burned. Click these thumbnails to leaf through the manuscripts. 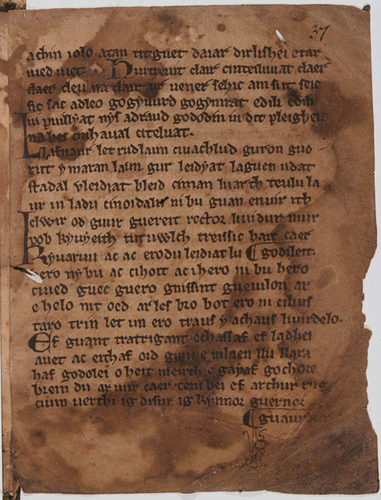 Pa gwr is in NLW MS Peniarth 1, the Black Book of Carmarthen, starting on folio 47v. When you click the thumbnail, a small window will open: to find the folio and see it in full view, you will need to click the full screen arrow, and if it is not already displayed, call up the Contents sidebar to see thumbnails of all the folios. Images appear by permission of the National Library of Wales. Preiddeu Annwn is in NLW MS Peniarth 2, the Book of Taliesin, starting on folio 25v. When you click the thumbnail, a small window will open: to find the folio and see it in full view, you will need to click the full screen arrow, and if it is not already displayed, call up the Contents sidebar to see thumbnails of all the folios. This is an engraving of the lead cross Gerald describes. The cross disappeared some time in the 18th century. 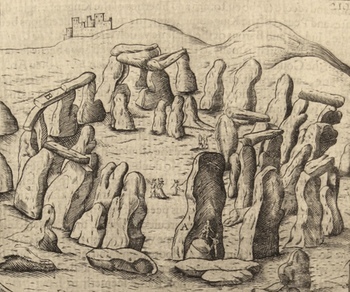 This illustration is found in Britannia, by William Camden (1551-1623). Special Collections has several printings of this important book. To see more pictures from these printings, visit the British Antiquities page. For that star signifies you, as does the fiery dragon beneath the star. The ray which stretches towards the shores of Gaul portends your future son, who will be most powerful, and whose power will extend over all the kingdoms which he will protect. And the other ray signifies your daughter, whose sons and grandsons will hold the kingship of Britain in turn. And thus the king spent the night with Ygerna and relieved himself through the sexual relations he desired. He deceived her through the false appearance which he had assumed. He also deceived her with the false words which he carefully composed, for he said that he had come secretly from the besieged camp so that he could see to the thing which was so dear to him, and also to his town. She, believing him, refused him nothing that he asked. Also that night was conceived that most famous of men, Arthur, who afterwards through his wonderful bravery won great renown. Now Arthur was a youth of fifteen years, of outstanding virtue and generosity. His innate goodness gave him such great grace that he was loved by almost all the people.... Arthur, because his strength was linked with generosity, decided to harass the Saxons so that he could enrich the household which served him with their wealth. Righteousness also moved him, for he ought by hereditary right to have the rule of the whole kingdom. This outcome was established by divine power, for as in former times the ancestors of those Romans had harrassed the ancestors of the Britons with invidious iniquities, so now those Britons strove to defend the liberty which the others sought to take away from them, refusing to pay the tribute which had been unjustly demanded of them. But that most famous king Arthur was mortally wounded; Arthur having been taken from there to the island of Avalon for the healing of his wounds, he handed over the crown of Britain to his cousin Constantine, son of Cador Duke of Cornwall, in the year 542 after the incarnation of our Lord. May his soul rest in peace. Thumbnails by permission of the British Library. Click the images to go to larger versions on the BL site.